Austin Kleon is the person who says that we should “Steal Like an Artist” and so I’m following his advice. This is something I found from his blog that I just needed to re-post because I totally agree with everything he says and I think it’s a point that needs to be really clear. Some artists may say that they do their work purely for themselves. But if they are sharing the work even a little bit instead of hiding in their secretly located studio like hermits then I think they are lying or fooling themselves. Most of us do our work because we love it and think it can somehow contribute, that someone else will love it too. That we can – in some small or big way – make the world a better place. There is a lot of uncertainty in creative work and so I think artists often rely on their fans and followers to embrace that every day and push forward. All I can add to this short how-to list is point 4) Go to point 1 and start again. 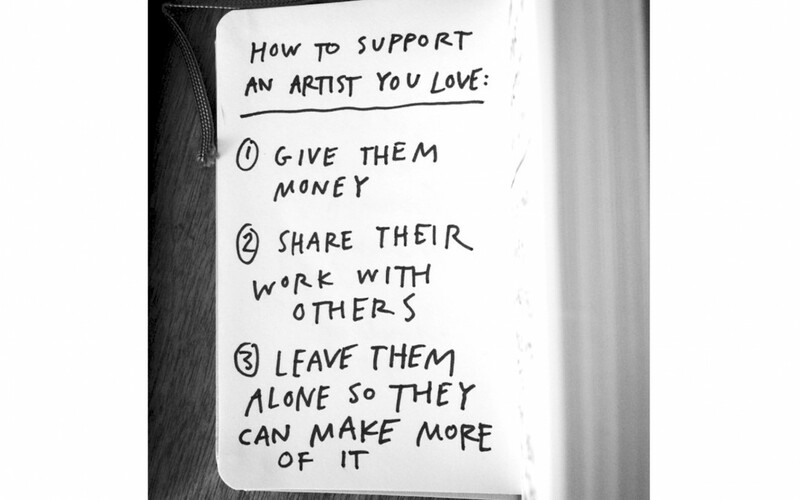 Support the artists you love and you will most definitely contribute toward making this world a better place.